Bold patterns, high-contrast colours, adorable animal characters and a fascinating crinkly texture make this the perfect soft cloth book for babies. Meet Parrot, Lion, Elephant and Crocodile in this friendly jungle edition. 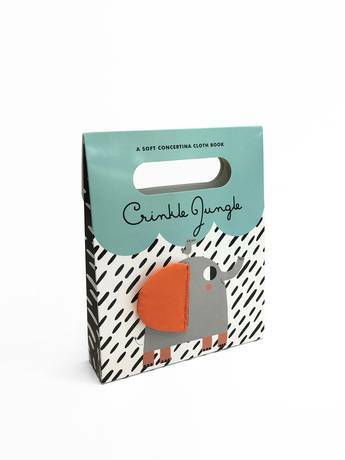 Introduce babies to adorable jungle animals with this gorgeous crinkly contrast cloth book! On one side each animal has its own page, while the other side has a fun scene featuring all the jungle friends: Parrot; Lion; Elephant; and Crocodile. The two middle pages have a tactile crinkly texture over the full surface area, and each end page features crinkle detail forming a flap. These tactile elements will fascinate babies and aid their sensory development. In addition to this, the bold patterns, black and white contrast and a bright colour palette will engage babies' attention and help support their visual development.